Last night I had trouble sleeping, so as usual, I let my mind wander. And equally as usual, it wandered to music. I cannot remember the process of things exactly, but it eventually stumbled upon a memory that had been filed away for years and I had forgotten I had. 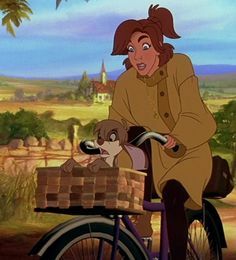 It was the memory of 20th Century Fox’s Anastasia, a gorgeous musical animation that tells a touching story (which while not historically representative, is taken from certain facts in the tragically short life of Anastasia Romanov). It was one of the films I was fortunate enough to watch as a child, and it had a huge impact on my appreciation for and relationship with music and drawing. I love 2-D animations. 3-D animations have their place, but there is something about the grittiness of hand-drawn cartoons that I will always love. After a rush of images, sounds and characters, my mind eventually settled on the scene where the title character (voiced by Liz Callaway) sings “Journey to the Past”. It is a beautiful song that aptly expresses the combination of eagerness and hesitation experienced by an 18 or 19-year-old Anastasia (or Anya as she was called at the orphanage) at the moment when she chooses what path she (and consequently, her life) will take. It is a song about making a bold decision, searching for meaning and belonging, and the anxiety of beginning of an adventure. After I replayed this song in my head (as well as the snatches of the film that go along with it that I could remember), I thought of the other song that gave me goose bumps whenever I sang it: “Once upon a December” where Anya invokes the ghosts of her past, a past that she no longer remembers with clarity since she was brutally separated from her family at a young age. Still she has some fragments of her life before the orphanage, but they’re not clear at all. I can only imagine how lost she felt. Still, I found it inspiring that she did not let her lack of a family or uncertainty of her past and future weigh her down; she was brave, intelligent and able to handle whatever life threw at her (including a murderous not-quite-alive-not-quite-dead villain who with an axe to grind). I have not watched the film in over a decade, and I wanted to write this before re-watching it so that I do not end up writing a film review. I simply wanted to share a good memory. If you have never watched the film, I highly recommend it. For any audience. It is aesthetically and musically pleasing, and it tells an inspiring story.